George Mason Blezard, was born in Oldham, England, on July 26, 1909. He immigrated to the U.S. (New Bedford, MA) in 1926 where he met and married Mary Anna Francis. 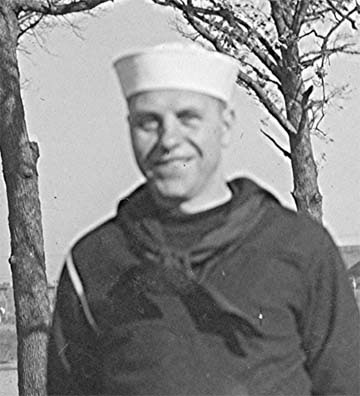 He enlisted in the Navy effective Sept 2, 1943 and, following Training at the US Naval Training School, Great Lakes, Illinois, was assigned to the U.S.S. West Virginia for the duration of WWII. Barbara, his only child, was born while he was at Great Lakes. George told stories of the 1945 kamikaze attack on his ship and of a bomb from the kamikaze plane penetrating the deck where he was working. He also talked about seeing the flag raised on Mount Suribachi. He crossed the International Date Line on Sept 30, 1944 and the Equator, where he was duly initiated a Shellback, on Oct 4, 1944. 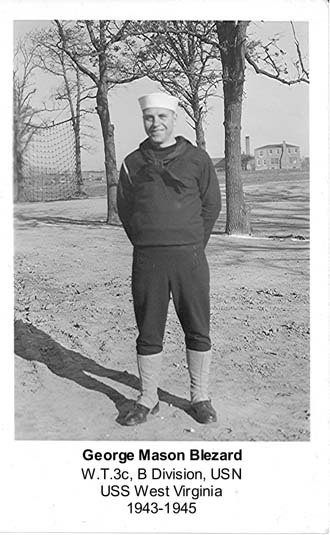 He said his fellow sailors called him "the old man" because he was in his 30s and most of them were still in their 20s. Following the war he moved his family to Lincoln Park, MI, where he spent the remainder of his life working in a machine shop in Trenton, and then in Flat Rock, MI. He passed away from cancer at age 54 on October 3, 1962. His wife Mary passed away at age 93 on December 1, 2005. His daughter Barbara is retired in Lancaster, CA. My father George was a good man who loved and served his country and his family with honor. I miss him.